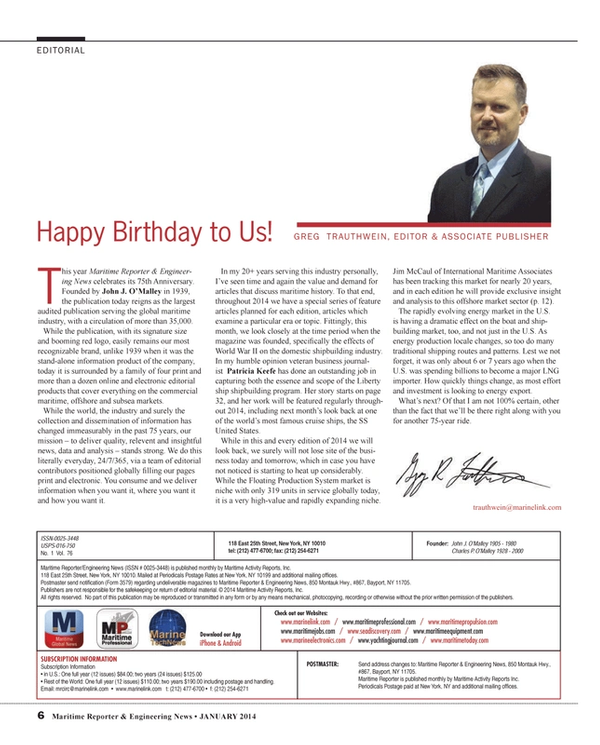 This year Maritime Reporter & Engineering News celebrates its 75th Anniversary. Founded by in 1939, the publication today reigns as the largest audited publication serving the global maritime industry, with a circulation of more than 35,000. While the publication, with its signature size and booming red logo, easily remains our most recognizable brand, unlike 1939 when it was the stand-alone information product of the company, today it is surrounded by a family of four print and more than a dozen online and electronic editorial products that cover everything on the commercial maritime, offshore and subsea markets. While the world, the industry and surely the collection and dissemination of information has changed immeasurably in the past 75 years, our mission – to deliver quality, relevent and insightful news, data and analysis – stands strong. We do this literally everyday, 24/7/365, via a team of editorial contributors positioned globally filling our pages print and electronic. You consume and we deliver information when you want it, where you want it and how you want it. In my 20+ years serving this industry personally, I’ve seen time and again the value and demand for articles that discuss maritime history. To that end, throughout 2014 we have a special series of feature articles planned for each edition, articles which examine a particular era or topic. Fittingly, this month, we look closely at the time period when the magazine was founded, specifically the effects of World War II on the domestic shipbuilding industry. In my humble opinion veteran business journalist Patricia Keefe has done an outstanding job in capturing both the essence and scope of the Liberty ship shipbuilding program. Her story starts on page 32, and her work will be featured regularly throughout 2014, including next month’s look back at one of the world’s most famous cruise ships, the SS United States. While in this and every edition of 2014 we will look back, we surely will not lose site of the business today and tomorrow, which in case you have not noticed is starting to heat up considerably. While the Floating Production System market is niche with only 319 units in service globally today, it is a very high-value and rapidly expanding niche. Jim McCaul of International Maritime Associates has been tracking this market for nearly 20 years, and in each edition he will provide exclusive insight and analysis to this offshore market sector (p. 12). The rapidly evolving energy market in the U.S. is having a dramatic effect on the boat and shipbuilding market, too, and not just in the U.S. As energy production locale changes, so too do many traditional shipping routes and patterns. Lest we not forget, it was only about 6 or 7 years ago when the U.S. was spending billions to become a major LNG importer. How quickly things change, as most effort and investment is looking to energy export. What’s next? Of that I am not 100% certain, other than the fact that we’ll be there right along with you for another 75-year ride.